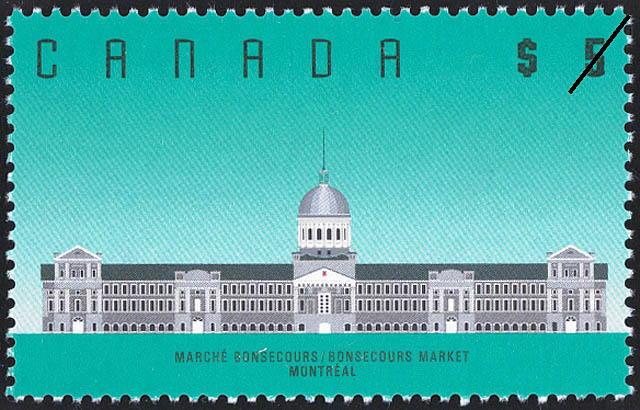 Canada Post Corporation is honouring Montreal's Bonsecours Market with the third stamp in a series celebrating Canada's architectural heritage. Designed by Montreal architect William Footner and constructed from 1842-45, the building has served as a market, town hall and, for a brief period after 1849, as the Parliament House of the Province of Canada. Its symmetrical, Neo-Classical style exemplifies the shape and form of many public buildings in the mid-19th century. This new $5.00 high-value definitive stamp is issued in conjunction with the XVIIth Congress of the International Union of Architects in Montreal. Montreal designed Raymond Bellemare created this Architecture stamp in the same tradition as the other two in the series. Beginning with a linear design of the building, Bellemare refined the image using computer graphics. Canada Post Corporation. Presenting, 1990.